Armando Iannucci, who has been appointed OBE, has been a constant presence in British comedy, on both sides of the camera, for more than 20 years. The writer, producer and performer was born in Glasgow to a Scottish mother and Italian father. He went to St Aloysius' College in Glasgow and as a teenager considered becoming a priest. Instead he studied at Oxford, gaining an MA in English literature in 1986 before pursuing a career in comedy. BBC Radio Scotland provided Iannucci with his first commissions, with No' The Archie McPherson Show, before the 48-year-old moved to London in 1989. He then made radio shows, including Armando Iannucci for BBC Radio 1, which featured a number of comedians he was to collaborate with for many years, including David Schneider, Peter Baynham, Steve Coogan and Rebecca Front. Iannucci first received widespread fame, alongside Chris Morris, for On the Hour on Radio 4, which soon transferred to television as The Day Today in 1994. Each episode was a mock news programme where the excessively brash style of reporting, and unnecessarily complex format, surreally parodied the current affairs format and earned the show numerous awards. The programme also featured Steve Coogan's Alan Partridge character in one of his earliest incarnations. Partridge was a relatively minor character here and was spun off into a number of multi award-winning TV series co-written by Iannucci, including Knowing Me Knowing You With Alan Partridge and I'm Alan Partridge. 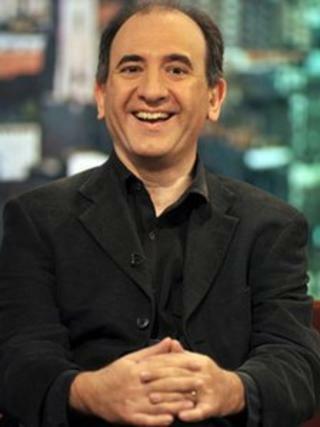 In 2000, Iannucci created two pilot episodes for Channel 4, which became the eight-part series The Armando Iannucci Shows. The series consisted of his pondering pseudo-philosophical and jocular ideas in between surreal sketches. Iannucci was quoted as saying it is the comedy series he is most proud of making. Perhaps the programme for which he is best known is The Thick of It, a political satire he wrote for BBC Four. It starred Chris Langham as an incompetent cabinet minister being manipulated by foul-mouthed spin doctor Malcolm Tucker, played by Peter Capaldi, who is said to be based on Tony Blair's former press secretary Alastair Campbell. The critically acclaimed series was broadcast in two parts in 2005 and two special hour-long episodes. A feature film spin-off, In The Loop - Iannucci's directorial debut - was nominated for the Best Adapted Screenplay Oscar in 2009 and helped make his name in the US. The comedian reportedly used his BBC press pass to enter the US State Department headquarters whilst researching the film, just turning up and rather vaguely claiming to be "here for the 12.30". He spent an hour inside taking photographs which were used for the film's set designs. The father-of-three said his OBE for services to broadcasting would not stop him poking fun at politicians. "I just hope it's not an attempt by the government to stop me because that's not going to happen," he said. The award had caused him at least one problem with the new series of The Thick Of It - due to be broadcast in the autumn - when one of the writers suggested a plotline which would see Tucker get a CBE. "I had to put that to one side because they didn't know what I knew," he said. However, Iannucci said he could not help but feel slightly "guilty" about accepting the award. "The honour is working with lots of performers and writers, so I did feel a bit guilty," he said.